You need not buy plans for the double chair with small dividing table single rocker chair and foot rest if you don’t want them all as they can be bought individually. The cost of the plans is inexpensive especially as you will be provided with so much information to build expertly. Each seperate design has it’s own detailed plan, along with full size patterns you can trace onto the lumber/wood for the shaped pieces. Still think you may encounter problems ? An assembly professional is at the end of a phone line to put you back on the right path. 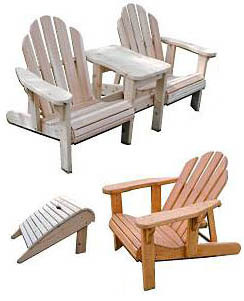 I’ve been unable to find another provider of Adirondack chair plans who include this after sale service. This plan is based upon the adult’s chair design the only difference being (apart from being smaller) it isn’t adjustable. I have to agree with that difference because the fewer moving parts in a child’s chair the better. More often than not, seating for our kids and in my case Grandkids is something we tend to ignore. They usually have to be propped up by cushions to enable their heads to appear above the table. Either that or are provided with a blanket on the ground, Little Miss Wynette. She was thinking of a different form of socialising. 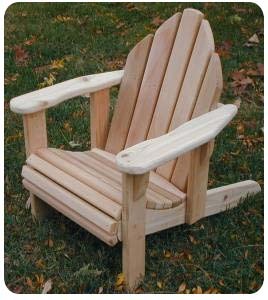 You can find further details and product comments by clicking on this link to Rocking Adirondack Chair which by the way doesn’t rock. Maybe it was a metaphor used by an ageing hippie. I thought I’d better show you the difference between a hippie’s version of a rocker and my version, so here is mine and as you can see it has a curved base which allows the chair to rock. As you can see by the price it isn’t too expensive to buy the plan and because of it’s simple but effective design the materials to build will not be outrageous.